After receiving a question on my Discord Server about how to view all shared voice messages on iOS, I decided to write a very simple tutorial to show you how it is possible to search all files on iOS. The Search feature allows the user to search specific messages that respect a criteria. 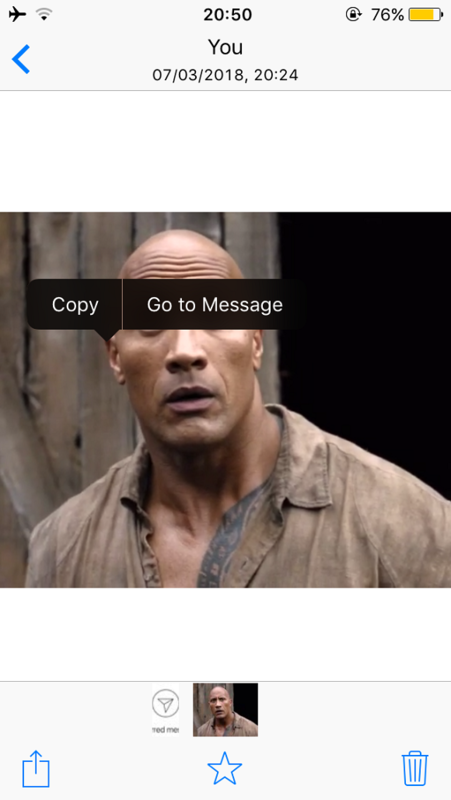 On iOS it can also be used to search specific media, highlighting them in the chat. Generally, to search a specific media, you need to search its extension. 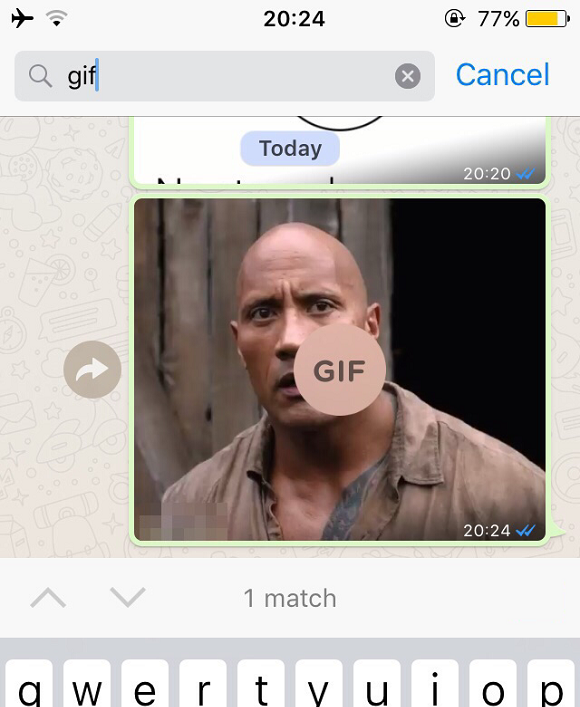 Typing gif, WhatsApp will highlight every bubble that contains a GIF. At the same way, you can type every other extension, for example jpg for searching photos, mp4 for searching videos, and all other extensions related to documents and files (doc, pdf, xls, zip, rar). This is very useful when you need to search a specific voice message. 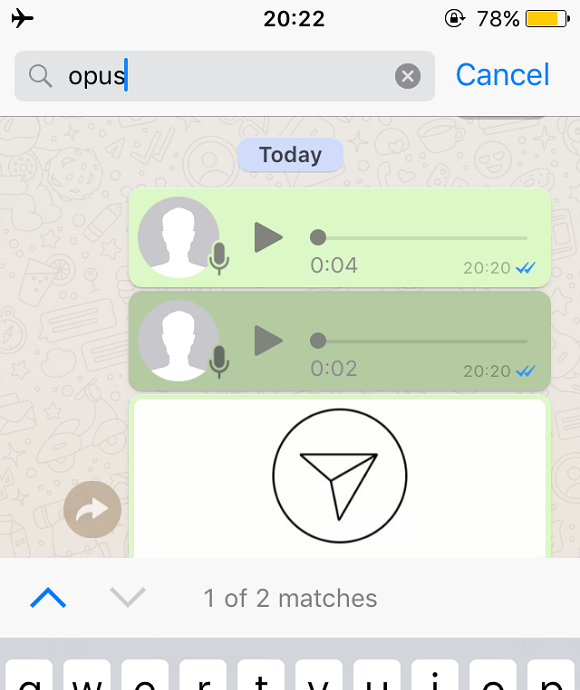 To view the list of all shared voice messages in a chat, you need to type “opus”, that is a lossy audio coding format supported by WhatsApp in iOS, Android and Windows Phone platforms. Actually, WhatsApp allows the user to “Go To Message”, for photos, videos, GIFs, links and audio files (that’s different than voice messages). The “Go To Message” feature is very useful when the media you want to view in the chat is visible in Media, links and documents, but there is not a feature that groups all shared voice messages in that section: following this guide you are able to do. This exclusively works on iOS. 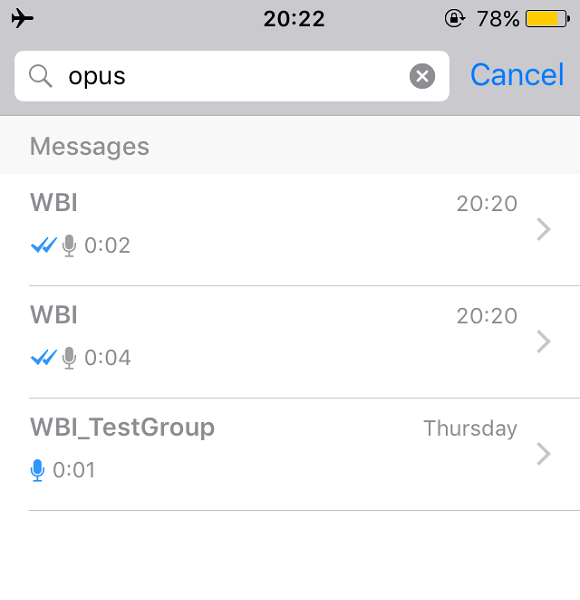 If you need to view the list of your shared voice messages on your Android device, you can use a File Manager, searching opus. • Locked Recordings feature spotted in WhatsApp for Android. Next PostNext WhatsApp beta for Android 2.18.75: what’s new?